For the next leg of our China Trip, we took the G-train (high speed train) from Harbin to Anshan. The journey took approximately 3 hours, but the G-train was going over 300 km/hr and it was a smooth ride! In Anshan, we visited Anshan Bethesda Rehabilitation Ministry (ABRM). ABRM is an unique ministry; they aid the disabled and immobilized people in the area. The Chinese government has little to no aid to the disabled. The founder, Dr. Xu, was a promising orthopedic surgeon but a freak accident paralyzed him. He later became a born-again Christian and received a calling to aid the many disabled by providing them wheelchairs. He eventually set up a clinic (ABRM) which provides physical therapy to the disabled. We had lunch with Dr. Xu and a few of the ABRM staff near the facility, where they introduced us to Liaoning cuisine! We had several dishes, all of them superb and unique to the Liaoning region. Here are two dishes that stood out. 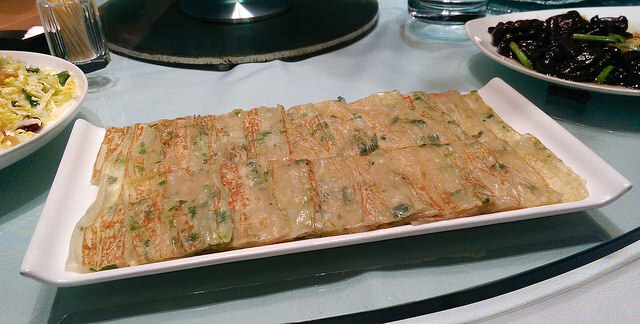 Green onion pancake is much thinner and softer in Anshan and Liaoning. The green onion pancake from Southern China and Taiwan is thicker. I had the Shanghai version earlier this year, which was thick but crispier. The dish shown above was given to us on the house! When the waiters placed it on our table, I initially thought they were sausages due to its shape and color. However, we were told it was spicy purple potato! Purple potato in spicy sauce. Purple potato is abundant in Northeastern China and served in many restaurants.